A good cleaning kit contains: 1-piece rod, bore guide, jag tip, brass brush, cotton patches, firearm screw driver kit, and brass hammer. A cleaning kit should contain a one-piece cleaning rod with a rotating handle. For patches, use a pointed jag rather than a loop. In the barrel, the tight-fitting jag and patch combination will remove more fouling than the loose fitting loop and patch. A kit should also have a bronze or brass brush, the same size as the bore. Along with a rod, jag, and brush, your kit needs lots of correctly sized cotton patches, as well as a bottle of bore solvent. (Shooter’s Choice and Hoppe’s Copper Solvent are examples that will remove copper and powder fouling.) Finally, a thin film of good lubricant such as Browning Gun Oil or Tetra Gun Oil is required to protect your gun after cleaning. Cleaning a rifle from the muzzle end may cause damage to your firearm. 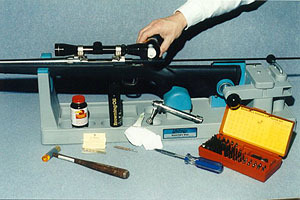 To clean your bolt action rifle, first remove the bolt from the receiver. Place the jag tip in the cleaning rod. Take a cloth patch and dip it in the solvent. Center the wet patch on the jag. Run the patch-tipped jag through the barrel from the back of the barrel where you removed the bolt. (Note: Never clean a rifle from the muzzle end unless you absolutely have to, such as with a lever, pump, or semi-automatic. You run the risk of damaging the rifling at the muzzle, and this may cause a loss of accuracy.) As the jag clears the end of the barrel, the patch will fall off. Remove the rod and repeat the process. Replace the jag tip with the brush and push it back and forth in the barrel at least 10 times. This will help loosen the copper fouling. Remember to keep your hand on the handle so the rod can rotate with the rifling. Next, replace the brush with the jag and a clean, dry patch. Then push the rod through the bore of the rifle. Repeat this process using several patches until the cotton patch comes out clean. Lightly oil a patch — only a drop or two of lubricant — and place it on the jag. Run a lubricated patch through the bore. This will protect the inside of the barrel until you are ready to practice again or go hunting. Finally, use a lightly oiled patch or cloth to wipe down all the outside metal surfaces of the firearm. If the firearm has been used in the snow, rain, or near salt water, then take the barrel and action from the stock and wipe the internal metal parts with an oiled patch. Alaska is a land of weather extremes. If you hunt the coastal areas, your firearms will be exposed to salt spray and high humidity and may rust in a matter of hours — even if they are made of stainless steel. If the internal parts, such as the trigger mechanism or firing pin, are exposed to salt water and humidity, they may not work when you need them. If you hunt in extremely cold temperatures, your firearm may not fire unless all grease and oil have been carefully removed. These difficult weather conditions make it essential to keep your firearm in good working order. Pack a small cleaning kit when you hunt. To maintain your firearms when you hunt, always pack a small container of light gun oil or lubricant, compact cleaning rod with a jag or loop, and plenty of cotton patches. Remember to take screwdrivers, Allen, or Torx wrenches that fit the screws on your gun, scope bases, and rings. Finally, pack a small roll of black electrician’s tape to cover the muzzle when you are hunting to keep out dirt, debris, and rain. Clean your rifle after every practice and hunting trip. After hunting each day, wipe all the metal surfaces of your gun with a patch containing oil or other lubricant. If you have been hunting in the rain or snow, you should also run an oiled patch through the barrel. If it rains or your gun falls into water, you should remove the barrel and action from the stock and carefully wipe dry and then lubricate all metal surfaces. Temperatures will affect your rifle. Never store your rifle inside a warm cabin or tent at night, or overnight in a waterproof gun case. In either situation condensation may form on your firearm, causing rust, or fog your scope. The best place to store your firearm in hunting camp is outside your cabin or tent, under a protective cover from rain or snow.